Seit gut vierzehn Tagen sind wir an der Playa Blanca, ein paar Kilometer südlich von Iquique. Das sind Leute, die das Meer lieben. Die Wochenenden verbringen sie oft am Strand, ein paar wohnen auch dauerhaft hier und hin und wieder treffen sie sich zu einem zafarrancho. Da wird dann lang und ausgiebig gefeiert. Uns haben sie gleich am ersten Tag „adoptiert“ und zu einem Abendessen mit viel gutem chilenischen Wein, Musik, Anekdoten aus dem Leben und viel Lachen eingeladen. So ähnlich geht das dann zwei Wochen weiter zwischen Meer, Möwen, Wein und Nachbarschaftsgesprächen. Wir erfahren viel über Chile und das Leben hier in Iquique. Hin und wieder fahren wir auch in die Stadt, um einzukaufen und uns das Zentrum von Iquique anzuschauen. Vor allem die Häuser und Bürgersteige, die früher aus alten Schiffsplanken gebaut wurden und gerade restauriert werden, sind sehenswert. Iquique ist schöner und hat viel mehr zu bieten, als wir erwartet hatten. Durch die Beschreibung von anderen Reisenden waren wir ein wenig voreingenommen. Mag schon sein, dass durch den Freihafen, der bei manchen Besuchern eine Art von Kaufrausch auslöst, auch die Versuchung für die Gauner wächst, den einen oder anderen Camper zu überfallen (so steht es jedenfalls in iOverlander), – aber wir haben davon nichts mitbekommen, nur die Freundlichkeit der Chilenen. Clemen singt: „Du wirst schon sehen, wie sie in Chile einen Freund lieben, wenn er ein Fremder ist.“ – Vielleicht haben wir das alles ja auch schützenden Mantel der „Virgen de Guadalupe“ zu verdanken. Auch wenn es noch so schön am der Play Blanca ist, irgendwann müssen wir weiter. Noch trennen uns über 5000 km von Tierra de Fuego. Wir rechnen mit mindestens zwei Monaten für die Fahrt bis Ushuaia. Desde hace más de 2 semanas ya estamos en Playa Blanca, un par de kilómetros al sur de Iquique. Hemos estacionado nuestra Esperanza al borde de una playa de arena muy linda, con partes de roca y vemos la silueta de Iquique en el fondo. 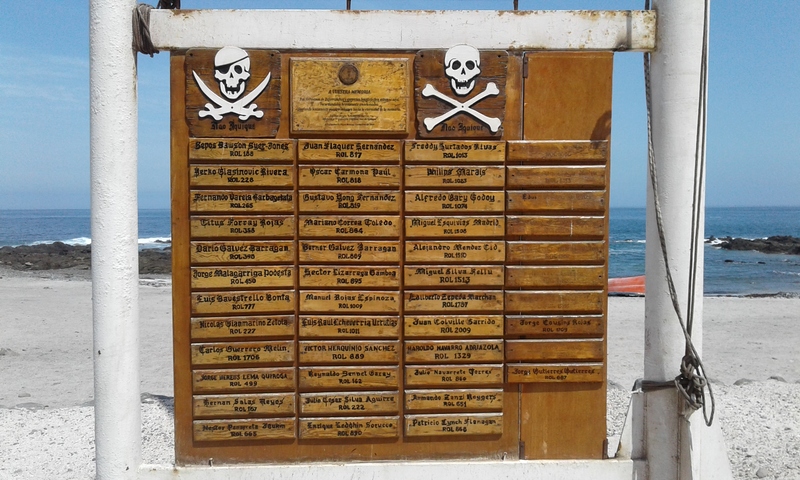 Detrás de nosotros se encuentran las casas de playa de los “piratas”. Quienes son los piratas? Es gente, adoradora del mar que tienen sus encuentros de cuando en vez que se llaman zafarranchos. Pasan los fines de semana en la playa, otros son permanentes. Nos han adoptado y nosotros a ellos. Nos conectamos rápidamente el primer día. Estamos en una cena liviana con mucho vino chileno delicioso, música y anécdotas de vida y risas. Más o menos así ha pasado el tiempo acá entre gaviotas, mar, piratas, vino y conversas de vecinos. Nos cuentan mucho de Chile y la vida acá en Iquique. De vez en cuando vamos a Iquique para hacer compras y conocer el centro histórico de la ciudad. Llaman la atención especialmente las casas y veredas en madera que fueran construidas hace tiempo de barcos hundidos. Muchas de ellas reconstruidas hoy. Iquique es en ese sentido una sorpresa agradable. Por algunos reportes de otros viajeros andábamos un poco preocupado. Es posible, que la Zona Franca de Iquique incite un tipo de consumo exagerado en algunos viajeros y también la codicia de los malos piratas, que a veces atracan a camperos (así dicen por lo menos en iOverlander) – pero nosotros no hemos experimentado nada en ese sentido, solamente el cariño de los chilenos. Clemen canta: ¨ Y verás cómo quieren en Chile al amigo cuando es forastero.“ – Quizás también es obra del manto protector de la „Virgen de Guadalupe“. Y casi cada mañana hacemos un paseo por la playa hasta donde las gaviotas. No hay nadie allá… sólo nosotros y los perros, que nos acompañan. Es un sitio muy lindo para meditar y hacer Yoga, no solamente para nosotros. Aunque nos gusta mucho en Playa Blanca, tenemos que partir. Todavía nos separan más de 5000 km a Tierra de Fuego. Contamos con dos meses más por lo menos para el viaje hasta Ushuaia, la parte más Sur del continente sudamericano. 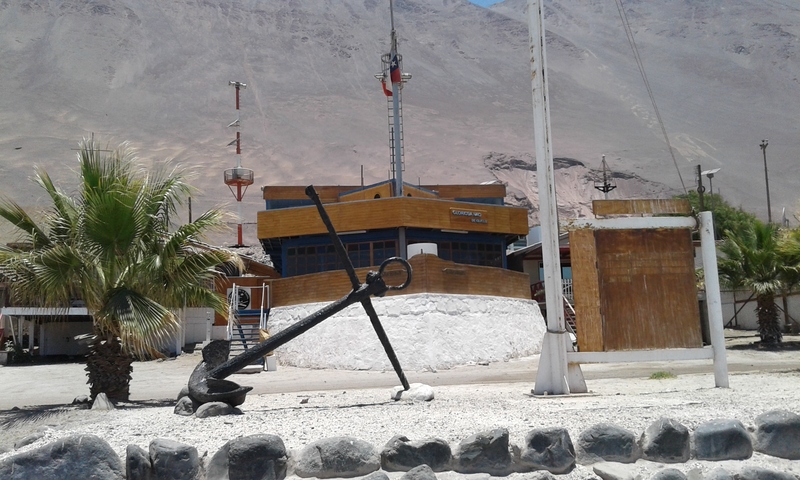 We have been at Playa Blanca, a couple of miles south of Iquique for over 2 weeks now. We have found a place at a beautiful sand beach with some rocky parts and a great view of the Iquique in the background. Behind us there is a row of beach houses, where “The Pirates” live. These people love the ocean. They often spend the weekends in their beach houses. Some of them even live here constantly and from time to time they meet for a zafarrancho, an event with lots of wine and food. The pirates „adopted“ us right on the first day and invited us for a great snack with lots of good Chilean wine, music, anecdotes of real life and much laughing. And now we have been here for over two weeks between seagulls, the ocean, wine and neighborhood conversations. We learn a lot about Chile and life in Iquique. From time to time we drive to the center of the city to go shopping and do some sightseeing. The houses and sidewalks, which were made of wood from shipwrecks in former times and which are being restored right now, are really worth seeing. Of course there are some restaurants in Iquique and the small places south of it, where you can eat excellent fish. And we do that a couple of times. Mainly the “Neptuno” in Iquique has a very special interior. Even though Playa Blanca is a very beautiful place, sometime we have to continue our trip. There are still more than 3000 miles, between here and Tierra de Fuego. We count with two months of traveling time at least for the trip to Ushuaia. Eigentlich wollten wir nur ein, zwei Tage bleiben. Aber jetzt beginnt schon der vierte Tag und wer weiß, vielleicht bleiben wir noch länger. Die meiste Zeit sind wir die einzigen Gäste hier oben im Hotel La Coruña. Trotz – oder besser wegen der Einsamkeit hier oben fühlen uns wir sehr wohl. Und das Thermalwasser hilft uns, die schwere Erkältung, die wir aus der Höhe von Huancayo mitgebracht haben, allmählich zu überwinden. Ya estamos en Mamiña desde hace unos días. Arriba del pueblo, muy cerca al cielo, allí esta el cementerio. Allí está todo muy, muy silencioso. Solamente el viento sopla un poquito entre las tumbas y las flores artificiales. Mamiña está en el extremo norte de los Andes Chilenos, aproximadamente 2750 metros de altura. Es un sitio bastante aislado con atardeceres muy lindos. Los restos de casas derrumbadas por los últimos terremotos deprimen un poco. Las aguas termales nos atrajeron. .El hotel donde aparcamos también tiene una piscina muy linda con aguas termales con 38 grados. Disfrutamos la piscina cada día y nos recuperamos de la primera etapa del viaje. Al principio solamente quisimos quedarnos acá un día o dos. Pero ahora el cuarto día ya ha empezado y – quien sabe – quizás nos quedamos unos días más. Casi todo el tiempo somos los únicos huéspedes. Las noches son muy, muy tranquilas en Mamiña. Apenas encontramos un habitante en las calles. Por otro lado hay bastantes perros, que viven en la calle. Todos son muy sociables, piden cariño y quieren acompañarnos. Inclusive en la estación de policía todo está muy tranquilo y los policías parecen dormir. A pesar – o mejor dicho – por la soledad acá arriba nos sentimos muy bien. Y las aguas termales nos ayudan a recuperarnos del fuerte resfrío traído de las alturas huancaínas. We have been in Mamiña for a couple of days now. Very high up above the small town, close to heaven, there is the cemetery. It is very, very quiet here. Only the wind blows a little bit between the tombstones and the artificial flowers. Mamiña lies in the northern Andes of Chile, almost 9000 feet high. It is a very lonely place with wonderful sunsets. The relics of houses, which were destroyed by the last earthquakes, are depressing. Originally we only wanted to stay here for one or two days. But now the fourth day has already begun and who knows, maybe we will stay here some more days. Most oft he time we are the only guests in the Hotel La Coruña. The nights are very, very quiet. Hardly do we meet any people in the streets. But there are lots of dogs everywhere. All of them very friendly, craving for love and willing to follow you everywhere. We would love to take them all with us. Even the police station looks peaceful and the policemen seem to be sleeping. In spite of he loneliness up here in the Andes – or maybe because of it – we feel very well in Mamiña. And the hot thermal waters help us to slowly but gradually overcome the severe cold, which we have brought with us from the heights of Huancayo.